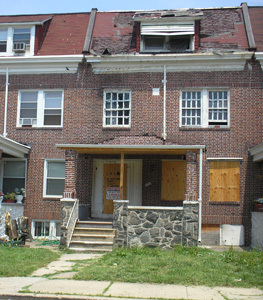 Pursuant to the Orders Appointing a Receiver to Sell a Vacant Building, et al., of the District Court of Maryland for Baltimore City, as noted below, passed in the matter of Mayor and City Council of Baltimore acting by and through the Baltimore City Department of Housing and Community Development, Petitioner v. the following Respondents, as per the case numbers stated below, the undersigned Receiver/Court Agent will sell at public auction on the premises, all those leasehold and fee simple lots of ground and the improvements thereon, situate and lying in Baltimore City, State of Maryland and being more fully described in the Deeds referenced as noted. Three story porchfront inside-group brick townhome. According to public records, the home contains 3,792 square feet of living area and 1,416 square feet of basement space. Lot sizes and gross building area were obtained from public tax records and are more or less. Except as noted, properties are zoned residential. IMPORTANT - EXCEPT AS NOTED ABOVE, THE PROPERTIES ARE BEING SOLD SUBJECT TO VACANT HOUSE NOTICES ("VHN") BY THE CITY OF BALTIMORE. THE PURCHASER SHALL BE REQUIRED TO REHABILITATE EACH PROPERTY ACCORDING TO THE ORDER(S) UNDER THAT VHN. A $2,500 deposit on each property, payable by certified check or cashier's check, will be required of the purchaser at time and place of sale. The deposit shall be increased to 10% of the purchase price within 24 hours at the Auctioneer's Office. Balance to be paid in cash at settlement, which shall take place within ten (10) business days following final ratification of the sale by the District Court of Maryland for Baltimore City at a location designated by the Receiver. If payment of the balance does not take place within the specified time, the deposit shall be forfeited and the property may be resold at the risk and expense of the purchaser. Interest to be charged on the unpaid purchase money, at the rate of 8% per annum, from date of sale to date of settlement. All adjustments as of date of sale. Taxes and all other public charges and assessments payable on an annual basis, including sanitary and/or metropolitan district charges, if any, to be adjusted for the current year to date of sale and assumed thereafter by the purchaser. The property will be sold in "AS IS" condition, without express or implied warranty as to the nature and description of the improvements as contained herein; and subject to easements, agreements, restrictions or covenants of record affecting same, if any, as well as existing zoning. Purchaser shall be responsible for obtaining physical possession of the property and assumes the risk of loss or damage to the property from the date of sale forward. The purchaser waives and releases the Receiver, the Auctioneers, and their respective agents, successors and assigns from any and all claims the purchaser and/or its successors and assigns may now have or may have in the future relating to the condition of the property, including but not limited to the environmental condition thereof. If the Receiver is unable to convey good and marketable title, the purchaser's sole remedy in law or equity shall be limited to the refund of the deposit. Upon refund of the deposit this sale shall be null and void and of no effect, and the purchaser shall have no further claim against the Receiver, the holder of the indebtedness or Auctioneers. Recordation costs, transfer taxes and all other costs incident to settlement to be paid by the purchaser. Time shall be of the essence for the purchaser. Due to the nature of the Receivership action and the Order of the District Court of Maryland for Baltimore City, Purchaser shall not assign this Contract without prior, written permission of the Receiver, which may be withheld in Receiver's sole and absolute discretion. PROSPECTIVE PURCHASERS MUST PRE-QUALIFY TO BID AT LEAST THREE BUSINESS DAYS PRIOR TO THE SCHEDULED AUCTION SALE. Bidders who are not pre-qualified SHALL NOT be allowed to participate in this auction; NO EXCEPTIONS. NOTE: If you have pre-qualified for other One House At A Time, Inc. Receiver's Auctions, please call 410-467-1826 and state your intention to bid. You may not be required to complete another form.